^ Kreikenbohm, Philip. "Card « NWA Starrcade 1987 - "Chi-Town Heat" « Events Database « CAGEMATCH - The Internet Wrestling Database". www.cagematch.net. Retrieved June 1, 2018. ^ "Robocop – Or Should that be RoboCrap?". Robocoparchive.com. Retrieved December 10, 2012. ^ "nWo Original Profile". Online World of Wrestling. Retrieved January 24, 2008. ^ "Fall Brawl 1996 results". Online World of Wrestling. Retrieved January 26, 2008. ^ Kevin Sullivan (March 31, 2014). WWE 50. DK Publishing. pp. 165–. ISBN 978-0-241-00675-7. ^ Martin, Adam (December 11, 2005). 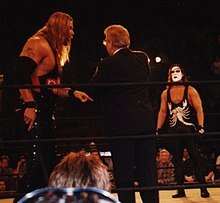 "Turning Point PPV results – 12/11/05 (Sting sends a message & more)". WrestleView. Retrieved December 18, 2008. ^ "Lockdown 2006". Pro Wrestling History. Retrieved September 3, 2011. ^ "Slammiversary 2006". Pro Wrestling History. Retrieved August 30, 2011. ^ "TNA Lockdown results". Pro Wrestling History.com. Retrieved March 21, 2009. ^ Cygy, Marcus (July 27, 2007). "iMPACT! 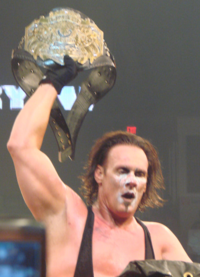 Results – 7/26/07 (Styles vs. Abyss – Roode vs. Sting & more)". WrestleView. Retrieved March 23, 2010. ^ Sokol, Chris (August 13, 2007). "Bad booking mars Hard Justice". SLAM! Wrestling. Retrieved April 16, 2009. ^ Caldwell, James (November 11, 2007). "Caldwell's TNA PPV report 11/11: Ongoing "virtual time" coverage of live PPV". Pro Wrestling Torch. Retrieved February 19, 2011. ^ Sokol, Chris (April 18, 2008). "TNA Lockdown:Joe captures gold". Canadian Online Explorer. Retrieved July 9, 2008. ^ Caldwell, James (May 11, 2008). "Caldwell's TNA Sacrifice PPV report 5/11: Ongoing "virtual time" coverage of live PPV". Pro Wrestling Torch. Retrieved January 16, 2012. ^ a b Meltzer, Dave. "TNA Victory Road PPV report". Wrestling Observer/Figure Four Online. Retrieved August 13, 2008. ^ "Hard Justice Pay-Per-View Results". TNAWrestling.com. Archived from the original on August 22, 2008. Retrieved August 11, 2008. ^ "Bound for Glory IV". Pro Wrestling History. Retrieved October 19, 2008. ^ "Against All Odds at Pro Wrestling History.com". Pro Wrestling History.com. Archived from the original on January 16, 2009. Retrieved February 24, 2009. ^ Caldwell, James (November 9, 2008). "Caldwell's TNA Turning Point PPV 11/9: Ongoing "virtual time" coverage of live PPV". Pro Wrestling Torch. Retrieved October 24, 2009. ^ "TNA Genesis". 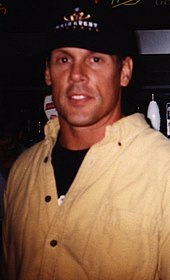 prowrestlinghistory.com. Retrieved January 28, 2009. ^ "Destination X 2009 at Pro Wrestling History.com". Pro Wrestling History.com. Retrieved March 28, 2009. ^ "Lockdown at Pro Wrestling History.com". Pro Wrestling History.com. Retrieved May 4, 2009. ^ Caldwell, James (May 24, 2009). "Caldwell's TNA Sacrifice PPV Report 5/24: Ongoing "virtual time" coverage of Sting vs. Foley vs. Jarrett vs. Angle". Pro Wrestling Torch. Retrieved May 25, 2009. ^ Caldwell, James (June 21, 2009). "Caldwell's TNA Slammiversary PPV Report 6/21: Ongoing "virtual time" coverage of King of the Mountain PPV". Pro Wrestling Torch. Retrieved June 22, 2009. ^ "Victory Road 2009". Pro Wrestling History. Retrieved September 19, 2009. ^ "Hard Justice 2009". Pro Wrestling History. Retrieved September 30, 2009. ^ Caldwell, James (September 20, 2009). "Caldwell's TNA No Surrender PPV Report 9/20: Ongoing "virtual time" coverage of Kurt Angle vs. Sting vs. Matt Morgan vs. A.J. Styles". PWTorch. Retrieved October 20, 2009. ^ "Impact: Bound for Glory takes shape". SLAM! Sports. Retrieved October 20, 2009. ^ Caldwell, James (October 20, 2009). "Caldwell's TNA Bound for Glory PPV Report 10/18: Ongoing "virtual time" coverage of the second-half of the show with Styles vs. Sting". PWTorch. Retrieved October 18, 2009. ^ a b Boutwell, Josh (January 1, 2010). "Impact Results – 12/31/09". WrestleView. Retrieved January 1, 2010. ^ Wilkenfeld, Daniel (October 22, 2009). "WILKENFELD'S TNA IMPACT REPORT 3/22: Ongoing "virtual time" coverage of Spike TV broadcast". PWTorch. Retrieved October 23, 2009. ^ Keller, Wade (May 3, 2010). "TNA Impact Results 5/3: Keller's ongoing "virtual time" coverage of live show from Orlando". Pro Wrestling Torch. Retrieved May 16, 2010. ^ Caldwell, James (May 16, 2010). "Caldwell's TNA Sacrifice results 5/16: Ongoing "virtual time" coverage of PPV – RVD vs. Styles, Jeff Hardy vs. Mr. Anderson". Pro Wrestling Torch. Retrieved May 16, 2010. ^ a b Caldwell, James (June 13, 2010). "Caldwell's TNA Slammiversary results 6/13: Ongoing "virtual time" coverage of live PPV – RVD vs. Sting, Hardy & Anderson, "nice surprise"". Pro Wrestling Torch. Retrieved June 13, 2010. ^ Wilkenfeld, Daniel (June 24, 2010). "Wilkenfeld's TNA Impact report 6/24: Ongoing "virtual time" coverage of Spike TV broadcast". Pro Wrestling Torch. Retrieved July 2, 2010. ^ Martin, Adam (February 24, 2011). "Spoiler: Title change at Impact taping for March 3". WrestleView. Archived from the original on March 1, 2011. Retrieved February 24, 2011. ^ Caldwell, James (March 3, 2011). "Caldwell's TNA Impact report 3/3: Ongoing "virtual-time" coverage of Impact on Spike TV – Hogan, wedding, 3/3/11 reveal, Tag Title match, retirement match, celebrities". Pro Wrestling Torch. Archived from the original on January 6, 2012. Retrieved March 3, 2011. ^ Boutwell, Josh (June 24, 2011). "Impact Wrestling Results – 6/23/11". WrestleView. Archived from the original on July 2, 2011. Retrieved June 30, 2011. ^ Baxendell, Matt (June 30, 2011). "Bax's TNA Impact Wrestling report 6/30: Ongoing "virtual-time" coverage of Impact with 'Limited Commercial Interruption'". Pro Wrestling Torch. Retrieved June 30, 2011. ^ Martin, Adam (July 11, 2011). "Spoiler: Big spoiler for Impact Wrestling". WrestleView. Archived from the original on July 15, 2011. Retrieved July 11, 2011. ^ "Impact spoiler – double main event at Bound for Glory". Pro Wrestling Torch. September 13, 2011. Retrieved September 13, 2011. ^ Keller, Wade (December 27, 2011). "Keller's TNA Impact Wrestling report 12/22: Hardy & Sting team against Roode & Ray, plus Angle visits Storm's favorite bar". Pro Wrestling Torch. Retrieved February 6, 2012. ^ Turner, Scott (February 10, 2012). "Turner's TNA Impact report 2/9: Alt. perspective review of TNA in London Week 2, final PPV hype". Pro Wrestling Torch. Retrieved March 16, 2012. ^ Turner, Scott (March 23, 2012). "Turner's TNA Impact Wrestling results 3/22: Victory Road fall-out, Dixie & Sting & Hogan close the show, three title matches". Pro Wrestling Torch. Retrieved March 23, 2012. ^ Caldwell, James (March 29, 2012). "Sting re-signs with TNA". Pro Wrestling Torch. Retrieved March 29, 2012. ^ Boutwell, Josh (May 16, 2012). "Impact Results – 5/24/12". WrestleView. Archived from the original on May 28, 2012. Retrieved May 24, 2012. ^ a b c Caldwell, James (June 10, 2012). "Caldwell's TNA Slammiversary PPV results 6/10: Ongoing "virtual time" coverage of live PPV – Roode vs. Sting headlines 10th Anniv. PPV". Pro Wrestling Torch. Retrieved June 10, 2012. ^ Caldwell, James (June 14, 2012). "Caldwell's TNA Impact Wrestling results 6/14: Ongoing "virtual-time" coverage of live Impact – TNA World Title match, Ultimate X starts the show". Pro Wrestling Torch. Retrieved June 19, 2012. ^ Caldwell, James (July 12, 2012). "Caldwell's TNA Impact Wrestling results 7/12: Ongoing "virtual-time" coverage of live Impact – Aries's first show as champ, BFG Series matches". Pro Wrestling Torch. Retrieved July 12, 2012. ^ Caldwell, James (November 8, 2012). "Caldwell's TNA Impact results 11/8: Complete "virtual-time" coverage of live Impact – final PPV hype, Ladder War conclusion". Pro Wrestling Torch. Retrieved November 8, 2012. ^ Caldwell, James (January 16, 2014). "Caldwell's TNA Impact results 1/16: Complete "virtual-time" coverage of "Genesis" Impact". Pro Wrestling Torch. Retrieved February 17, 2014. ^ Caldwell, James (January 23, 2014). "Caldwell's TNA Impact results 1/23: Complete "virtual-time" coverage of "Genesis" Night 2 - TNA Title vs. Sting's career, Angle vs. Roode cage match, new X champ, more". Pro Wrestling Torch. Retrieved February 17, 2014. ^ Trionfo, Richard (April 15, 2014). "Warrior's Greatest Matches summary". PWInsider.com. Retrieved April 15, 2014. ^ Trionfo, Richard (April 17, 2014). "ULTIMATE WARRIOR: LEGEND OF THE ULTIMATE WARRIOR SPECIAL SUMMARY". PWInsider.com. Retrieved April 18, 2014. ^ Johnson, Mike (July 14, 2014). "Lots of Sting updates, including where you will see him next". PWInsider.com. Retrieved July 15, 2014. ^ Clapp, John. "Sting vs. Triple H". WWE. Retrieved February 23, 2015. ^ a b "Pro Wrestling Illustrated Award Winners Most Popular Wrestler of the Year". Wrestling Information Archive. Archived from the original on September 5, 2011. Retrieved June 26, 2008. ^ "Thunder in Paradise Episode Guide". Fly.hiwaay.net. Retrieved December 10, 2012. ^ "Sting' Out of the Ring". CBN.com. November 15, 2004. Retrieved November 26, 2010. ^ "No. 38 – Garrett Borden". APU.edu. November 25, 2010. Retrieved November 25, 2010. ^ "NWA/WCW World Television Title history". Wrestling-titles.com. Retrieved June 26, 2008. ^ a b "NWA World Heavyweight Title history". Wrestling-titles.com. Retrieved June 26, 2008. ^ "WCW International World Heavyweight Title history". Wrestling-titles.com. Retrieved June 26, 2008. ^ "NWA/WCW United States Heavyweight Title history". Wrestling-titles.com. Retrieved June 26, 2008. ^ "WCW World Heavyweight Title history". Wrestling-titles.com. Retrieved June 26, 2008. ^ "WCW World Tag Team Title history". Wrestling-titles.com. Retrieved June 26, 2008. ^ "Pro Wrestling Illustrated Award Winners Most Improved Wrestler of the Year". Wrestling Information Archive. Archived from the original on September 21, 2011. Retrieved June 26, 2008. ^ "Pro Wrestling Illustrated Award Winners Inspirational Wrestler of the Year". Wrestling Information Archive. Archived from the original on August 13, 2011. Retrieved June 26, 2008. ^ "Pro Wrestling Illustrated Award Winners Wrestler of the Year". Wrestling Information Archive. Archived from the original on April 16, 2008. Retrieved June 26, 2008. ^ "Pro Wrestling Illustrated Top 500 – 1992". Wrestling Information Archive. Archived from the original on August 13, 2011. Retrieved June 26, 2008. ^ "TNA World Tag Team Title history". Wrestling-titles.com. Retrieved June 26, 2008. ^ a b Martin, Adam (January 24, 2008). "Full 2007 TNA Year-End Awards Results: Finisher, Tag Team, Feud, more". WrestleView. Retrieved July 15, 2011. ^ "The UWF Tag Team Championship". Wrestling-Titles.com. Retrieved June 26, 2008. ^ Palma, Richard. "WWAS – World Wrestling All-Stars World Heavyweight Title". Solie. Retrieved June 26, 2008.